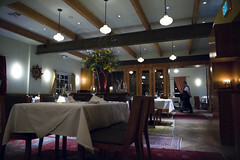 Fine dining is an explicit dining experience that you can enjoy even without having to go to an expensive restaurant. You can have fine dining right in your home, as long as you know how to set the table, from choosing the appropriate kind and number of china to picking the right occasion where this table setup can be used. Step 1: Know how many people you are going to be setting the table for. This information will determine how large the table is and how many chairs you need. This will also help you determine how many table covers you are supposed to prepare. Warning: Knowing how many people will sit at a fine dining table will spare you the embarrassment of having too many guests crowding on one table. This can be both awkward for you and your guests and may leave you scrambling to find a chair to make an extra table setting in a hurry. This is something you wouldn’t want to do in a fine dining event that you are hosting. Step 2: Lay-out the tablecloth, linens,and silverware. Knowing how to lay out the cutlery is absolutely necessary, as it is the layout of the china and utensils that differentiate fine dining from casual or family table settings. The fork is placed to the left of the, and the knife and spoon on the right. The dessert spoon and fork is usually placed on top of the cover. In fine dining, there are no coffee cups or condiments on the table, as these are served according to the course where they are used. Warning: If you do not want your fine dining event to be mistaken for casual or family setup, then laying out the utensils and china properly is one way to avoid that. An incorrectly laid out table can destroy the whole fine dining ambiance that you want to create. Step 3: Determine the method of service, and inform the staff beforehand. The method of service can either be left to right. This is another way to add to that fine dining experience, since having an order to how meals are distributed are a distinguishing characteristic of fine dining. Women are usually served first followed by the men. Warning: You need to determine the method of service in advance especially if using the services of the waiting staff. This way, you can avoid confusing your servers and your guests on how the meals are supposed to be served and collected. Fine dining is an experience that you do not have to pay much to try. You can set up a fine dining table yourself as long as you know how to lay out the cutlery and how the meals are supposed to be served. Knowing how to set up a fine dining table will give you and your family and friends a chance to experience a little bit of the finer things in life right at your own home without the hefty restaurant bill afterward. Organizing Your Refrigerator – Tips on how to do kitchen-related tasks. Cleaning Your Refrigerator – Tips on doing kitchen-related activities. Diet Plan – About food-related issues and ideas. Meal Time – Dining and other family dining preparation and experiences. Chef Choi – All about cooking and other food-related ideas. Setting-up Bedroom – On how to set-up furniture in your home. Fine dining at home is very practical and more convenient. You do not have to make reservations at a restaurant or wait in line for the table to be set. It is also more intimate and guests especially those who have been to your home already can feel relaxed and comfortable. Fine dining also need not be expensive, you do not need to buy expensive china, table cloths or utensils. You just have to have the proper ones. Another advantage of fine dining at home is that the food can be cooked according to your taste. Fine dining at home does not need any expert individual to set up the venue for you. All you need is a little creativity, some imagination and a lot of patience. You just need to check on the kitchen material and utensils available at your own kitchen. You do not have to buy new ones. All you need to do is to mix and match your existing utensils, dining wares and glass wares that will fit the motif you have in mind. The type of food from appetizer, main courses and salads must have to be align with the whole concept of the evenings dinning activity. Cap your dining activity with a bottle of wine to start and heat up the night. I agree with whimsical1207 about the practicality of fine dining at home. But I have to say that fine dining in a restaurant is not that bad either. I had the chance to attend fine dining evenings before and learned so much about it (not to mention I enjoyed it). I learned so much about fine dining etiquette. Things like you should eat the different types of food served altogether because they are meant to be complimentary. That food should be passed counter-clockwise. After washing my using the finger bowl, it should be placed on the upper left side of the setting (same with the napkin after finishing your meal). And that after eating , your knife and fork should be placed in the ten o’clock to four o’clock position. Engaging yourself in these kind of events will eventually make you learn more about the proper dining etiquette. Although Fine Dining at Home isn’t practical as mentioned by other commentators above, Josephine and Whimsical127, if planned correctly, it could save you from the costs of eating out at a restaurant. Also, the cozy and familiar ambiance that a house provides for its guests or diners is irreplaceable, coupled with good background music or a personal musician or band if affordable. It also is a great way to show off to friends or even relationship partners and their family. Nothing provides a sense of welcome/comfort than a fine dinner at home with family and friends. Fine dining at home puts elegance and class into your environment. However, doing it everyday is not only impractical but also takes away the charm of it. You can do it once in a while like anniversaries, engagement announcements or celebration for promotion at work. You can also just borrow few antique dining pieces from friends or family and it will help if you know someone who can cook very well to save time and effort in planning. It will also a great bonding for you and your friends. Who says fine dining is for rich people only? It is very easy to set the table for formal dinners. As a general rule in table setting, everything should be equally spaced. The dinner plate is placed first with at least two feet distance from one plate to another. The setting should have enough elbow room for the guests to be comfortable while they are eating. Then all the other utensils are put together with equal space, too. Start from the outside going towards the dinner plate. Now for the table napkin: If you don’t know how to fold the napkin artistically, it is safe to put the napkin inside the water goblet or fold it in rectangular shape and put it to the left beside the fork. To add elegance to the table setting, put flowers and candles. There will be enough room at the table since the food will be served according to the menu. Don’t be afraid that it would crowd the table.